Please note – this article was published many years ago – March, 1991. If prices are listed, they reflected prices at the time the article was written, or a year or two before that. The song says “It isn’t easy being green.” I disagree. Being green is very natural. Green trees, grass, and bushes prove how much nature loved this color. It is a part of the basic color spectrum. It is not surprising that this color was used very extensively in carnival with Fenton, Northwood, Imperial, Cambridge, and Millersburg leading the parade. It is most interesting, however, to note that not all companies went along with this thinking. It is most difficult to find a green piece that was made by Dugan, U.S. Glass, or Westmoreland. The one Farmyard by Dugan and the rare Frolicking Bears by U.S. Glass are glaring exceptions. The fact these pieces have turned up in green has always made me wonder if we could possibly be wrong as to the maker of these patterns. There are many shades and variations of green, but for some reason we have never broken them down as finitely as we have the blues. Ice green, emerald, mint, olive, lime green, and helios are the categories most often recognized. In this article I have dealt with the standard dark green color. Even then we can do little more than scrape the surface, as hundreds of patterns and shapes were made in green. 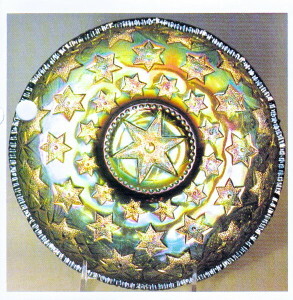 MANY STARS ICE CREAM SHAPE BOWL (Millersburg). 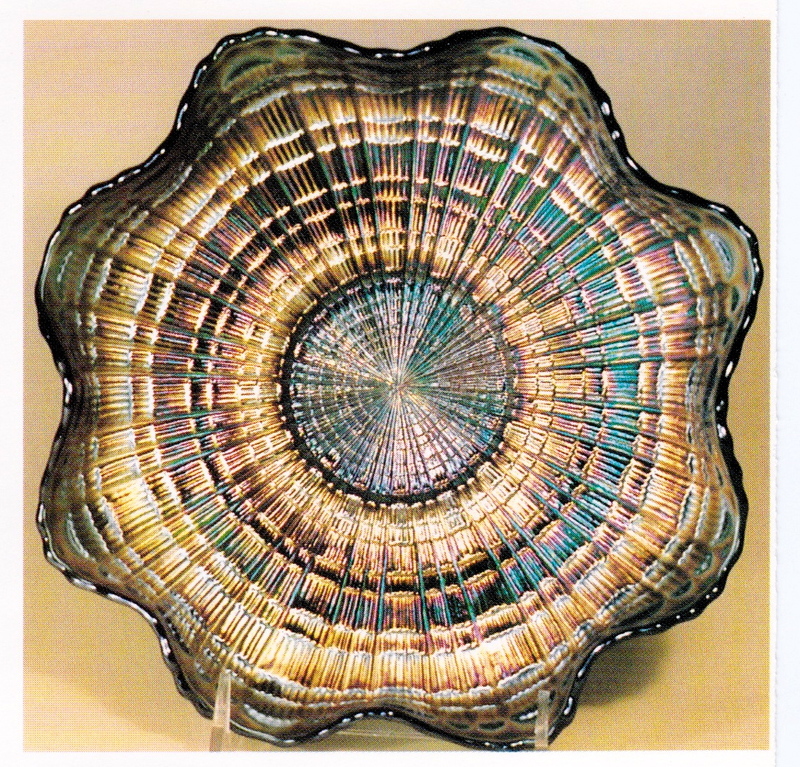 This 9 1/2” – 10” diameter bowl is the only piece made in this pattern. It is known in green, marigold, amethyst, and a rare blue. Ironically all of the Bernheimer advertising pieces which utilize this bowl are blue. Blue in Millersburg is rare. 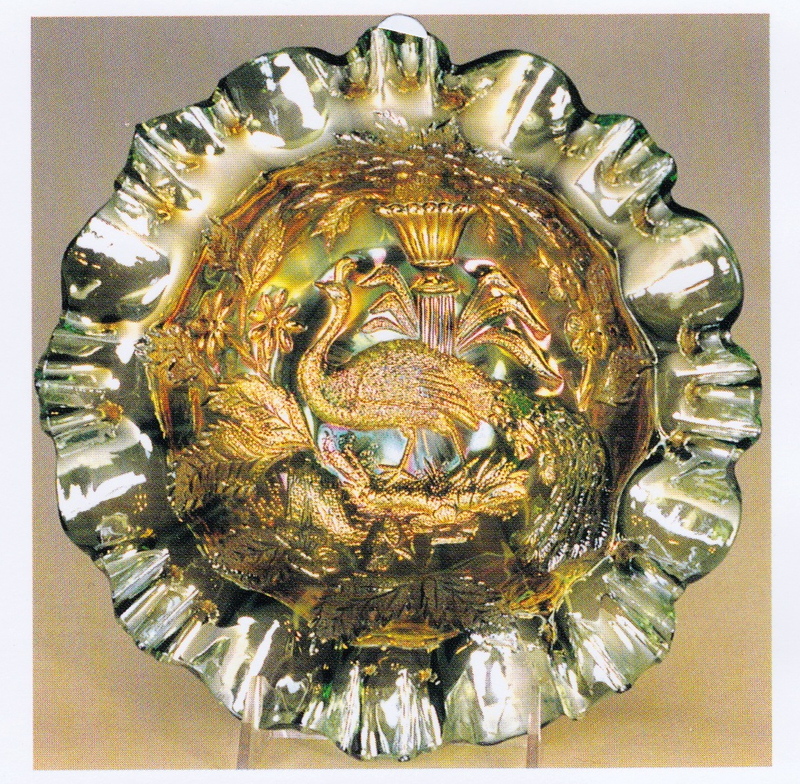 PLAID RUFFLED BOWL (Fenton). 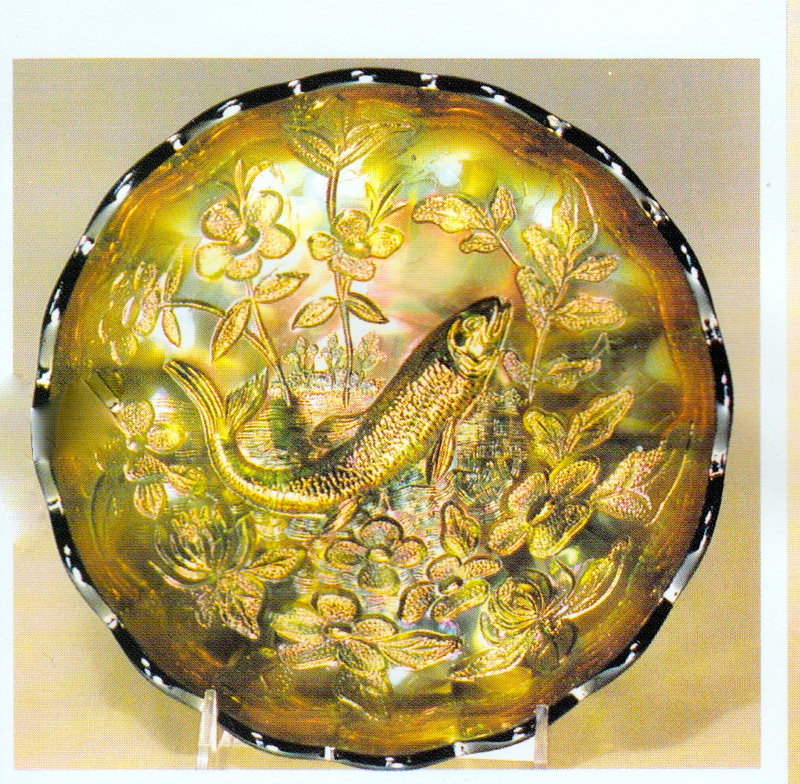 The piece pictured here is scarce in green and sold at the Britt auction in March of 1989 for $1250. The fellow that paid that for it will be released shortly. It is found more frequently in blue and marigold, and is very rare in red, celeste blue, and amethyst. BIG FISH ICS BOWL (Millersburg). 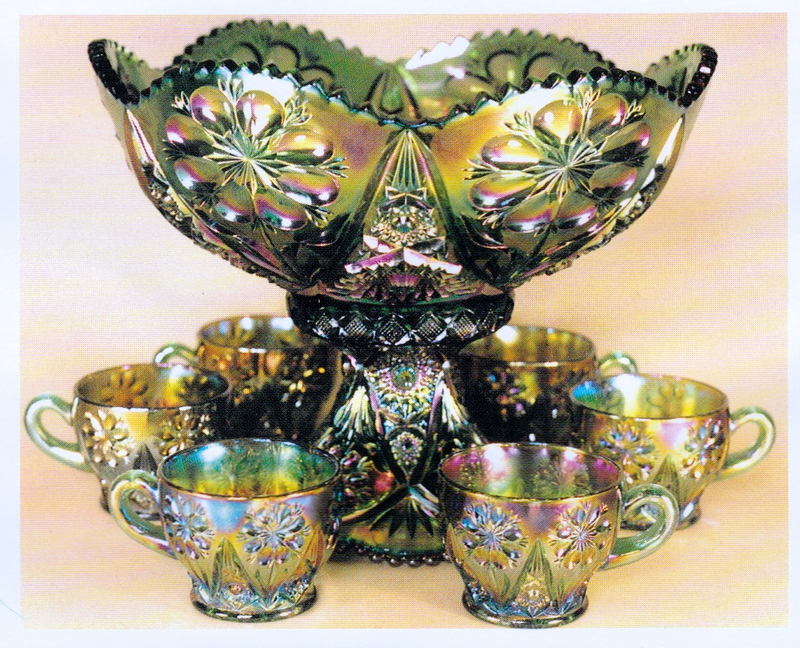 This very scarce pattern is found in marigold, amethyst, and green in ruffled, ICS, and square bowls. Five or six bowls are also known in vaseline. They are very rare. 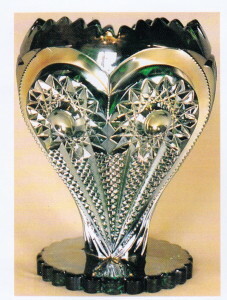 OHIO STAR VASE (Millersburg). 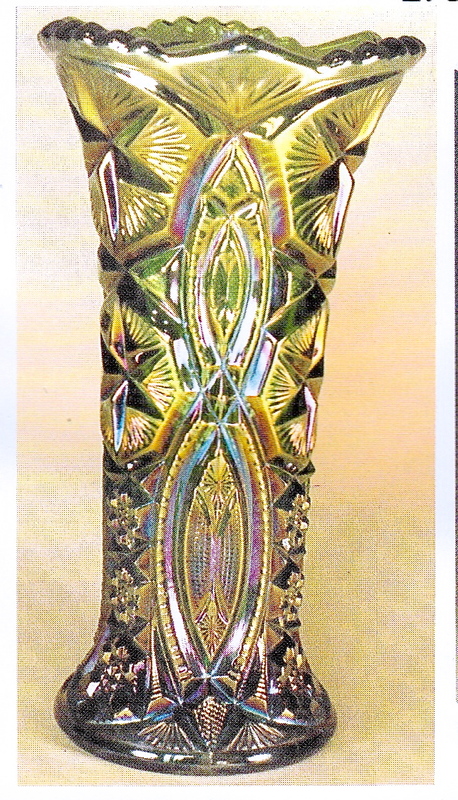 This handsome vase is known in marigold, green, and amethyst. One in white and two in aqua opal are confirmed. They are very rare as are the pair of swung whimsey pieces in green owned by the Rineharts. 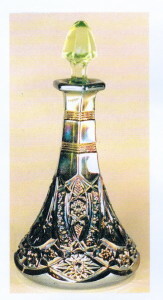 A swung vase is also reported in aqua opal and in amethyst. THISTLE PLATE (Fenton). 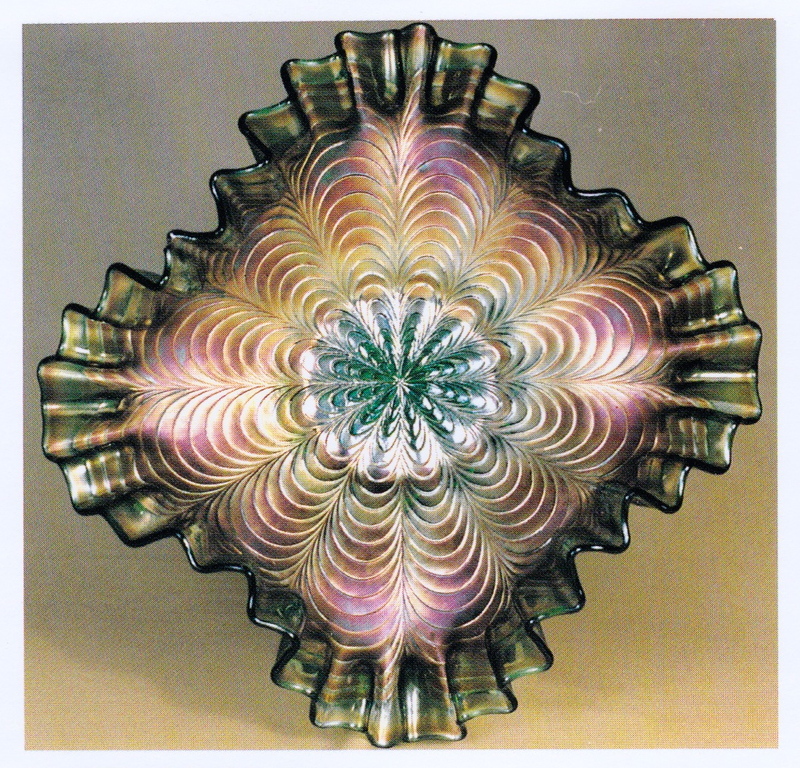 This pattern is found in variously shaped bowls in marigold, green, amethyst, and blue. 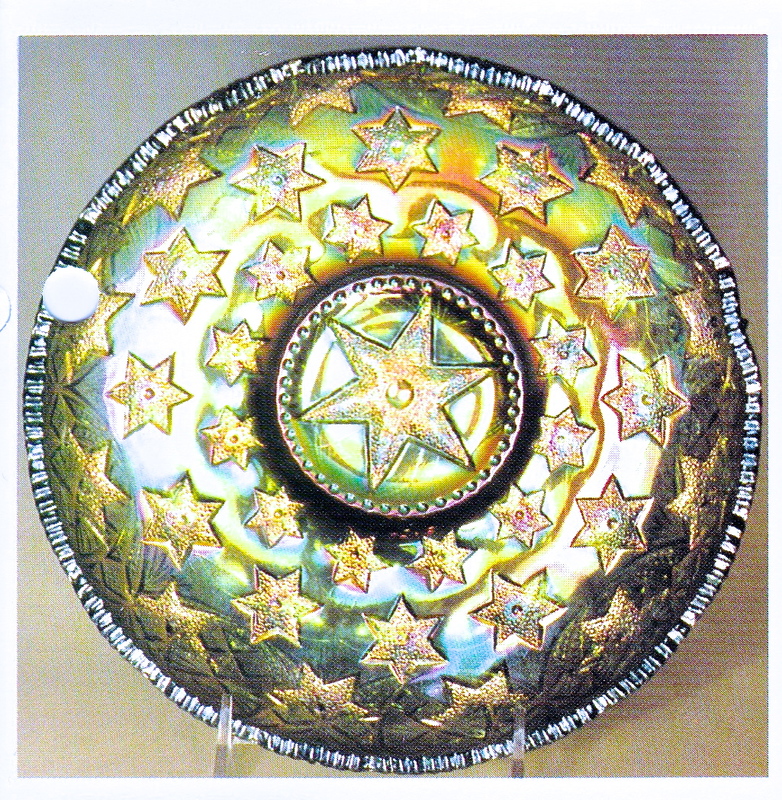 While quite common in the bowl shape, the plates are rare whether in green, amethyst, or marigold. To my knowledge, a plate in blue has not been confirmed. GRAPE AND CABLE PIECRUST EDGE BOWL (Northwood). This bowl is a small part of the shapes, colors, and sizes that were made in this most famous of all carnival patterns. This stippled 8 1/2” PCE bowl is found in blue, green, aqua opal, ice blue, and ice green. I would assume it was made in marigold, but I’ll be darned if I can remember seeing one. SINGING BIRDS MUG (Northwood). 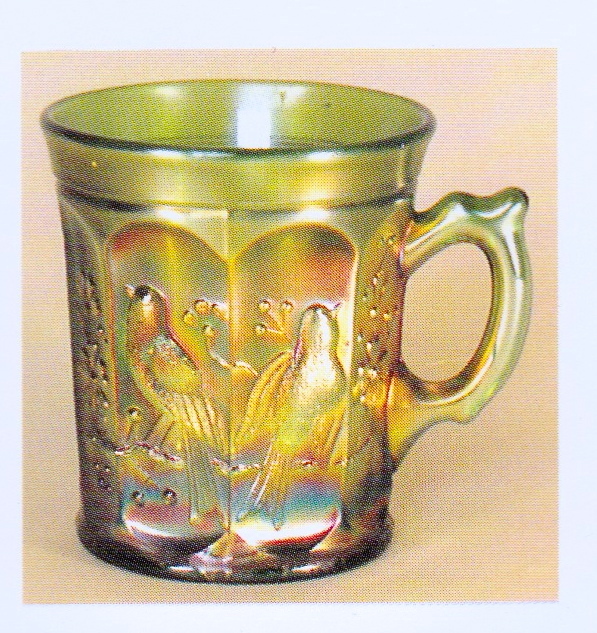 The mug in this popular pattern is found in so many different colors and shades that I will not attempt to list them. John Britt could write a book on this mug alone. The one shown here in green is a bit scarce and will bring around $250 at auction. Stippling will almost double the value. It is very rare in white, ice blue, and aqua opal. 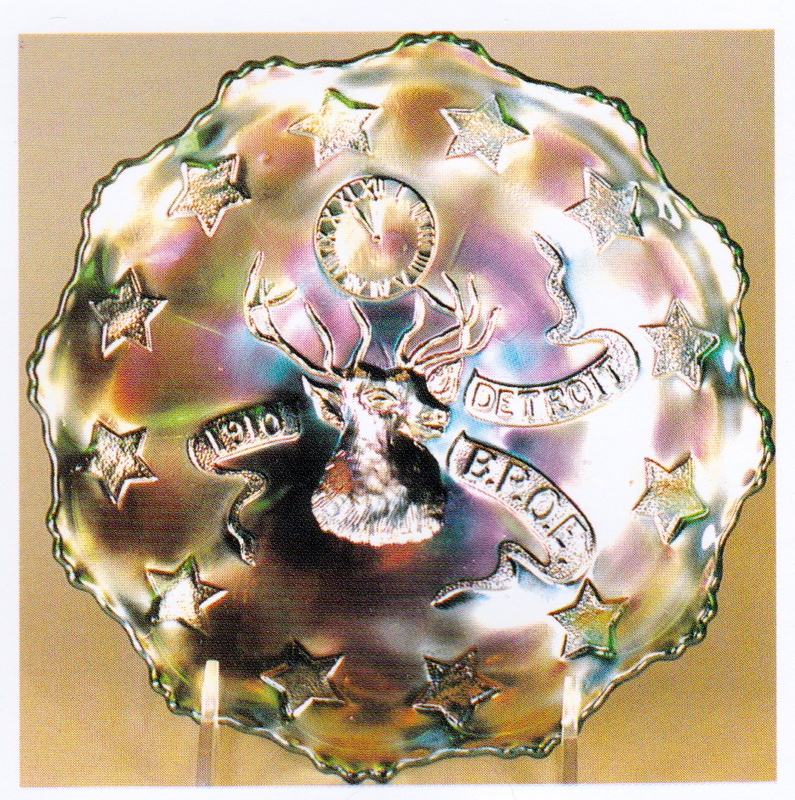 DETROIT ELK PLATE (Fenton). 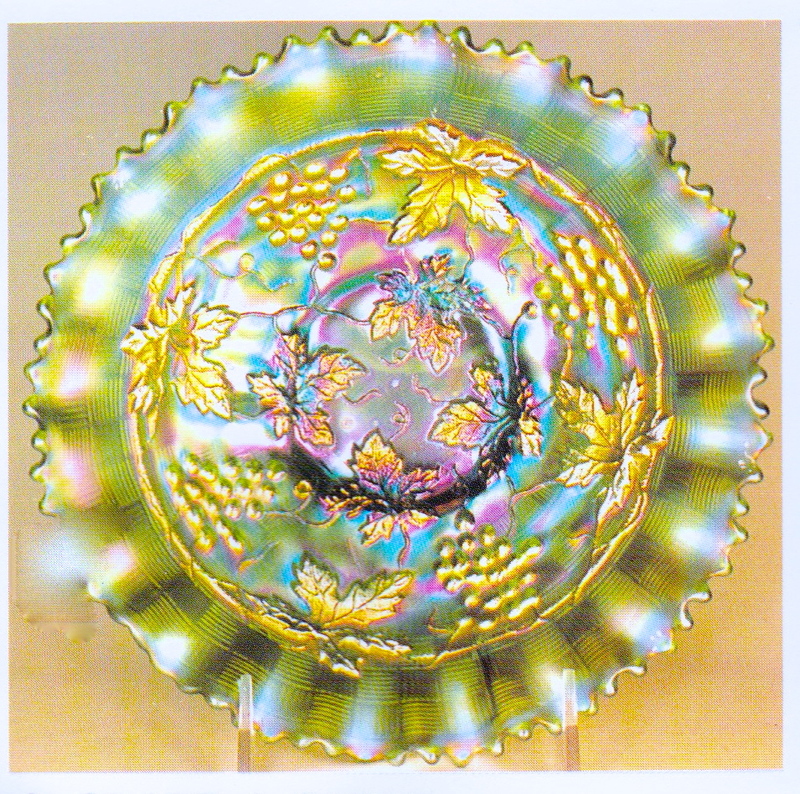 The bowl in this scarce pattern is found in amethyst, green, and blue with a rare marigold one reported. The plate shown here is one of two known in green. To my knowledge no other plates in any color are confirmed in this pattern. 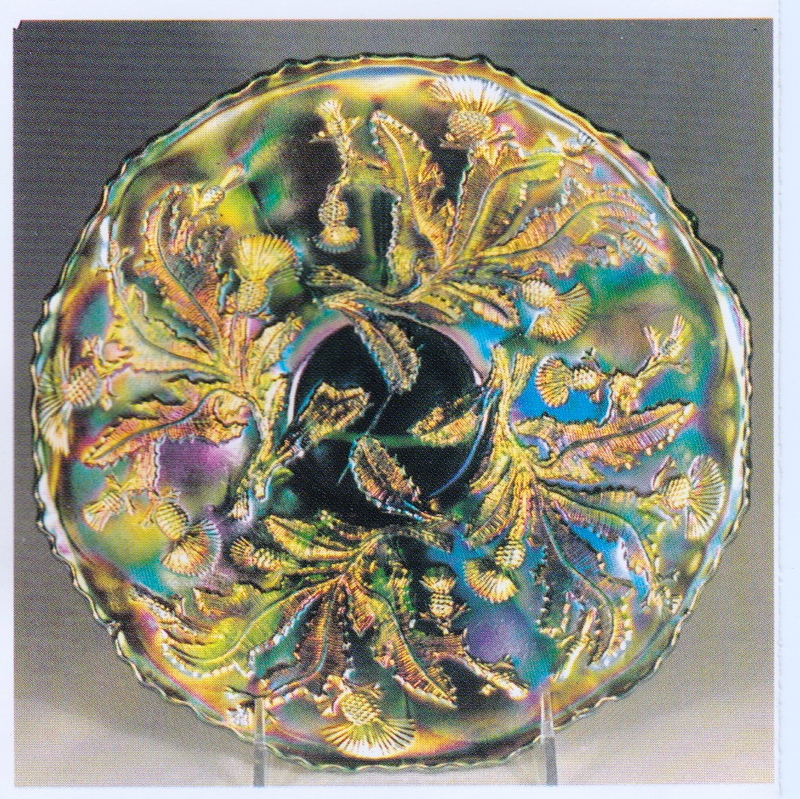 PEACOCK TAIL SQUARE CRIMPED EDGE BOWL (Fenton). This piece proves the point that it doesn’t have to be rare to be beautiful and highly desirable. This is the only example I have seen of this pattern in this shape. 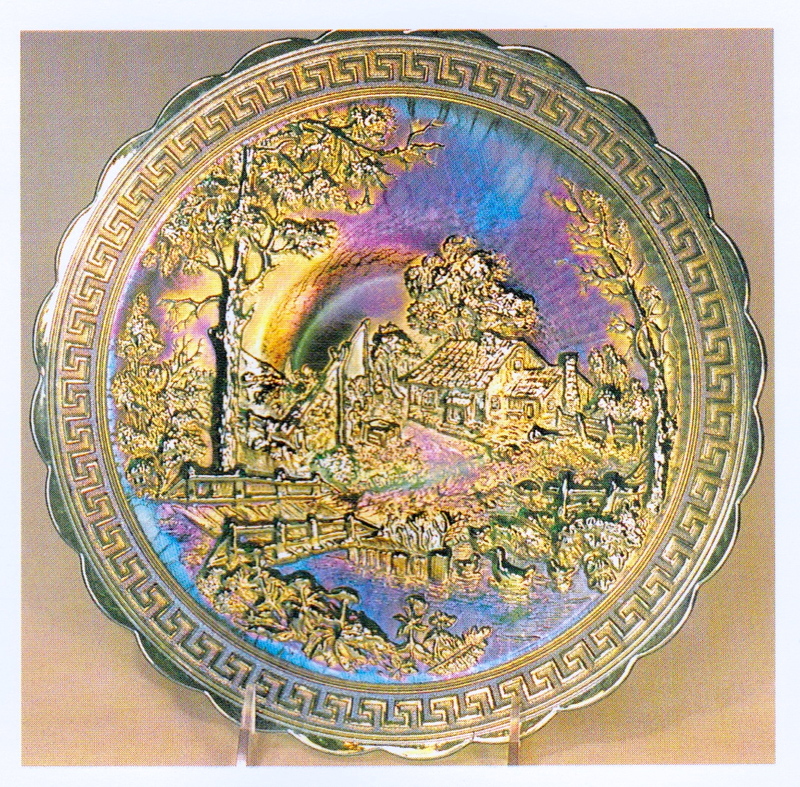 Generally, it is an easily found pattern, but is rare in red, peach opal, or in a 9” plate. 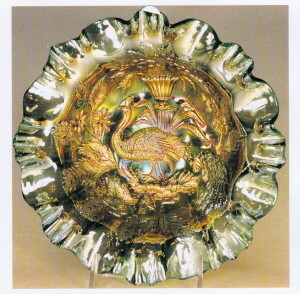 MILLERSBURG PEACOCK BOWL WITH CANDY RIBBON EDGE. 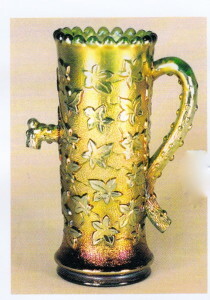 This is the version of the widely used Peacock and Urn pattern that does not have the bee or the beading on the urn. It is by far the hardest one to find. These 10” bowls are usually spectacular. Most of them have radium finish and are found in green, amethyst, and marigold. It is seldom found with a candy ribbon edge since they are normally ruffled or ICS bowls. 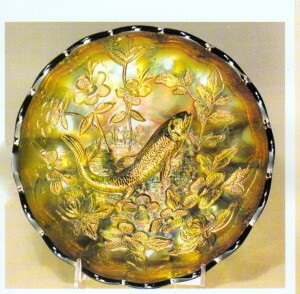 The bowl shown here sold at a Woody auction in 1987 for $900. CAMBRIDGE COLOGNE. Cambridge used a lot of green along with marigold and amethyst. Like Millersburg, anything in blue Cambridge is rare. This company is best known for Inverted Feather, Inverted Thistle, Buzz Saw, and Double Star. The stopper shown here with the cologne is the correct one, but is not iridized. FOUR-SEVENTY-FOUR PUNCH SET (Imperial). This set is readily found in marigold, but is very scarce in green and rare in purple. This pattern was also made in a water set, milk pitcher, vases, and stemware in various sizes and shapes. TOWN PUMP (Northwood). Northwood was no stranger to green, but it was used less frequently than purple or marigold to say nothing of the various pastels. The Town Pump in purple is found more frequently than marigold. This piece in green is rare. One sold for $2100 at the Noonan auction in 1986. ZIPPERED HEART VASE (Imperial). This piece is known as the “Queen’s Vase”. I’m not sure just why it was called a vase. Cambridge’s Venetian is shaped much the same, and it is called a “giant rose bowl”. The same can be said for Millersburg’s Hobstar and Feather in this shape. Whatever shape we call this piece, it is rare. It has been reported in marigold and amethyst in addition to green. The one shown here is the only one I’ve seen in any color. NU-ART HOMESTEAD PLATE (Imperial). Much of the green produced by Imperial was helios, a silvery type of iridescence which has never been popular with most collectors. Not so the green used on this Homestead plate. It is almost an emerald green with stretchy iridescence. 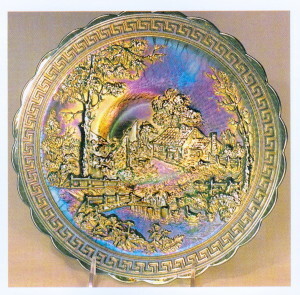 Two green Homestead plates sold at auction in 1986. Each brought $950. 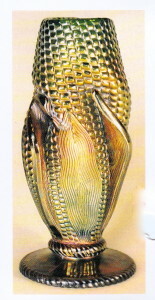 CORN HUSK VASE (Northwood). Two of these rare vases are known in green and three or four have been found in purple. They are very different than the standard Northwood Corn vase, which comes in a wide range of colors and does not have the extended husk. The two green Corn Husk vases are different than those in purple. 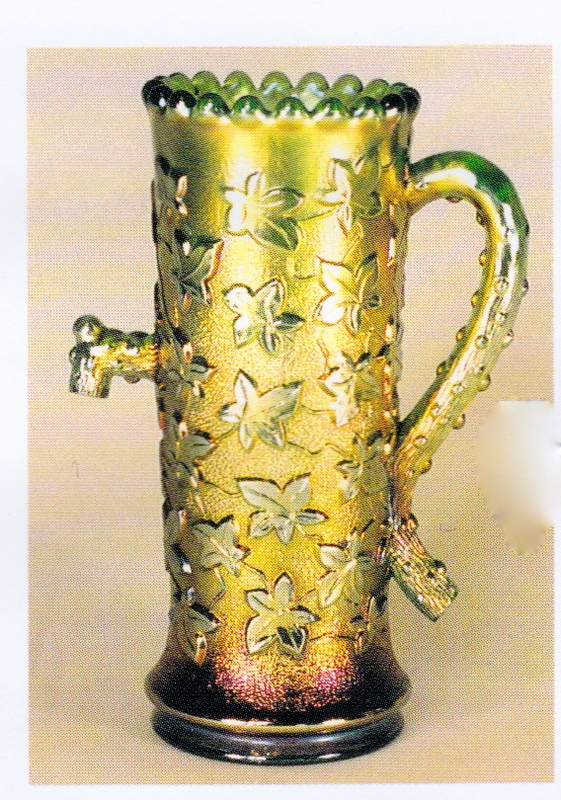 These have beading around the base and a second ring of beads at the junction of the base with the vase portion of the piece. The purple ones do not have this beading. Well, if you’re not seeing green at this point, it isn’t my fault. I tried.